It is not official on the route record, having done the B13 it is not on the MDT. Haven't had the greatest browse in south London but I am really surprised by the stands at Vassall Road. 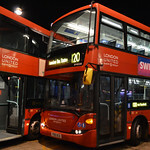 If I'm correct, the Camberwell New Road, Brixton Road and Clapham Road routes (bar the 333) all use those stands. Those 8 or 9 odd routes which are very high in PVR; make it crucial for not 1 but 2 bus stands to be erected!! I'd like to add route 323 to the list. Between the termini of Mile End and Canning Town; the route is only allowed to curtail at East London Mail Centre and is the norm if traffic on both the A12 & A13 get particularly bad. There is a disused alighting point only bus stop / flag on Penge High Street for the Crooked Billet stand. I've never seen any driver use it. Not marked on the road as a bus stop. In practice the main stop outside the sh*tty post office is used as the alighting point for the 227 short turns. However the 194 drivers always kick everyone off at Penge Sainsburys and run light to/from the stand. Whitton Church is a good one, quite nicely off route for the 281, and not actually at Whitton Church, but on Whitton Dene. The H22 can use it as well, displaying Whitton Dene rather than Whitton Church , because the H22 doesn't go past Whitton Church ! The R9 does have a turning point "Orpington Walnuts Centre"
M Penge Crooked Billet used for turns on the 194,197 & 227. Being used frequently at the moment ! The N3 too. It is used once in a blue moon. The 194, and 358 for that matter, drivers are supposed to turf everyone off at Sainsburys as of course the Crooked Billet stand is off their normal route. Late running 358's often go OOS to Crystal Palace via the 227 route. I've always wondered how the 98 gets to the stand in Coverdale road (just off willesden lane) and whether it is an official turning point. I'm happy to be corrected but don't some blinds say WILLESDEN LANE Christchurch? The curtailment at "Southall, The Green" is only allowed for the 120, 482 and H32, not the 105, 195 or E5. The 111 can curtail to Heston, and this exists on iBus, but no SPs or ADEs at Hounslow have it on the blinds! The 474 and N551 can't curtail to Gallions Reach Station, despite passing it. Only the 101, 262 and 366 are allowed to. That B13 route record is slightly out of date, it would have had a new record for the new contract that started in January which may have had the additional turns added. Turns can be added or removed mid contract as well normally as a result of a road layout chafe or major development works. Route P12 has just had a turn added at Peckham Rye, which it hasn't had for the past 5 years or so and route 63 gained a Farringdon Street turn in place of its Ludgate Circus turn which it lost some years ago when Stonecutter St was pedestrianised. Both are wrong about the 358. Light form Penge to CPP was never done in the 3 years I was at MB and drivers never said anything about it as it's roughly the same time both ways so doesn't make any difference. They use light to and from Elmers End and run via Birkbeck. The turn on the 358 is left at Pawleyne Arms, chuck off at the stop in Croydon Rosd then spin round like the 176 does. The two you have stated will only be used when there is two B13 so you will rarely see them, in the event there were severe delays you would have to be around the route to see one they are not on the MDT either only Avery Hill Road is on it. Light from Penge via the 227 was during roadworks at Anerley, obviously not a regular thing then. It has to be said that some night routes simply won't call at all possible curtailment points; a reason could be that residents don't want their beauty sleep disturbed by buses, such as a late VLA roaring down their street lool. Let's take the N550 for example. It does not have any turns in the Isle of Dogs; however mirror route D7 has Canary Wharf, Island Gardens & Cubitt Town. Ignoring Canary Wharf for possible security reasons, route N550 goes past the Island Gardens stand & Cubitt Town turning point but isn't contracted to use them.